What is IELTS Exam? IELTS stands for International English Language Testing Systems. It assesses the ability and extent of the candidate to be able to read, write, listen and speak English language. All the mentioned parameters enable a person to sustain in an English speaking country. The said examination is most widely used to assess candidatures for English language around the globe. It is accepted in all major countries where English is practiced and preached as the primary language for interaction and learning like the UK, Canada, Australia and New Zealand. IELTS has also found grounds in the USA of late. Thousands of universities and institutions across the country accept the IELTS examination. There are two different types of IELTS examination a candidate may appear for, depending upon his purpose of taking the test. Based on the requirement of a candidate, he/she appears for the above-mentioned tests. 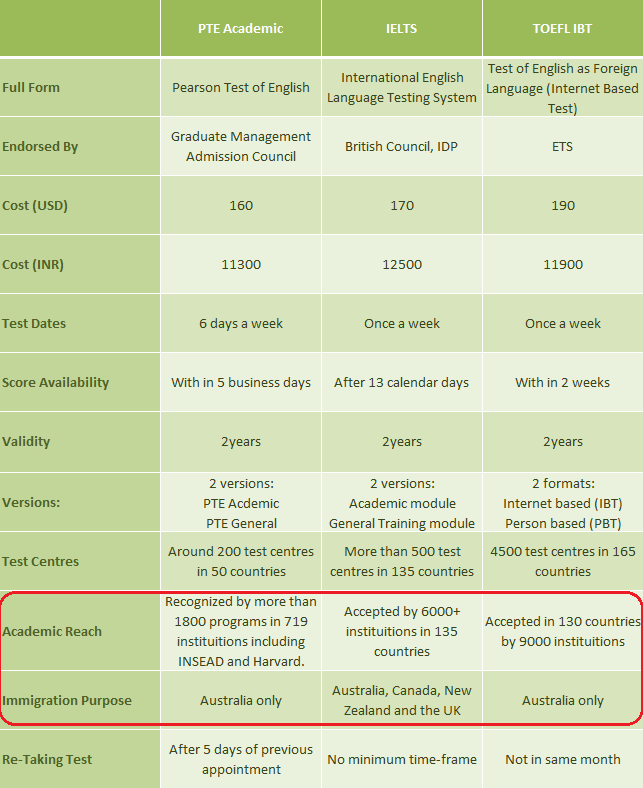 Speaking and listening modules remain the same for both the test types but the reading and writing test requires a higher level of efficiency in case of the Academic test as the candidates taking up this test need to involve themselves in an educational set up in an English speaking country. This sort of test is for the people who have a basic intend to take up higher studies in an English speaking country or if they are medical practitioners willing to practice in an English speaking entity. This test is for people willing to take up job or immigration opportunities in an English speaking country. Part 1 – GENERAL INTRODUCTION – In this part, the invigilator asks general questions concerning to life, likes, habits, schedule, hobbies, choices, family, etcetera which the candidate needs to answer promptly and in brief. There can be 4 to 6 questions for this part of the test. Part 2 – CLUE-CARD ROUND – The candidate is handed-over a clue-card whereby a question concerning to candidate’s experience is written along with a few clues in order to help the candidate to create his response. He is given only 1 minute to ponder about the given topic and he needs to answer the same in 1 to 2 minutes. Upon the completion of 2 minutes, the invigilator asks the candidate to stop speaking and progresses over to the third part of the test. Part 3 – DISCUSSION – The last part of the speaking test is related to the clue-card round. The topic of the clue card round becomes the concern for analytical discussion. This part may involve 3 to 5 questions. The listening test involves 4 sections whereby there are 10 questions for each part and a total count of 40 questions. The candidate is handed over a workbook where all responses need to be written during the span when the audio is playing and once the audio is over, the test- taker is given 10 minutes to transfer the answers to an answer sheet. Academic Reading - 40 questions spread over 3 passages with increased precision of difficulty. Each passage would carry 13 to 14 questions. General Reading- 40 questions over 3 sections and 5 passages. Each section carries 13-14 questions. ACADEMIC WRITING - This module carries 2 tasks. Task 1- Report writing (illustrating a diagram of words) Word limit-150 words. Allotted time- 20 minutes. GENERAL WRITING - this module carries 2 tasks. Task 1 – Letter writing. Word limit-150 words. Allotted time- 20 minutes. Next World Education is one of the best IELTS Coaching Institute in Delhi and the ielts training provide here will help the student in the following ways to achieve the desired scores. Next World Education is offering online and classroom coaching for IELTS Coaching, TOEFL Coaching & PTE Coaching in Barakhamba Road in Connaught Place, Delhi. The location is preferred by one and all for taking coaching in IELTS, TOEFL and PTE for people from Lutyens Delhi like Raisina Hill, Kasturba Gandhi Marg, India Gate, I.T.O., Connaught Place, Jhandewalan, Patel Nagar, Pahar Ganj, Chandni Chowk, Ajmeri Gate, Karol Bagh to name a few in Central Delhi. North Delhi areas like Civil lines, Vidhan Sabha, Timarpur, Mall Road, Delhi University Campus Area, Maurice Nagar, Shakti Nagar, Roop Nagar, Malka Ganj, Ghanta Ghar, Ashok Vihar, GTB Nagar, Mukherji Nagar, Model Town, Azad Pur, Adarsh Nagar, Derawal Nagar, Tagore Park, Shalimar Bagh etc. Assessment of student’s ability to achieve the desired score. The suggestion about the required time period to achieve the required scores. Improving analytical writing skills and learning the varied style of writing required for different sorts of writing assessment tasks.